I took 676 photos in four days in Belgium – its a picturesque place. But I’m having trouble distilling my photos, so I turned to my file of images from Tel Aviv in November. I don’t love olives and I didn’t eat hummous until I was 22, so Tel Aviv is not the culinary paradise for me that it is for many. Even so, I ate incredibly well. The pita bread at the corner store made me understand why people eat pita bread. The pomegranates were literally the size of my face (see below). 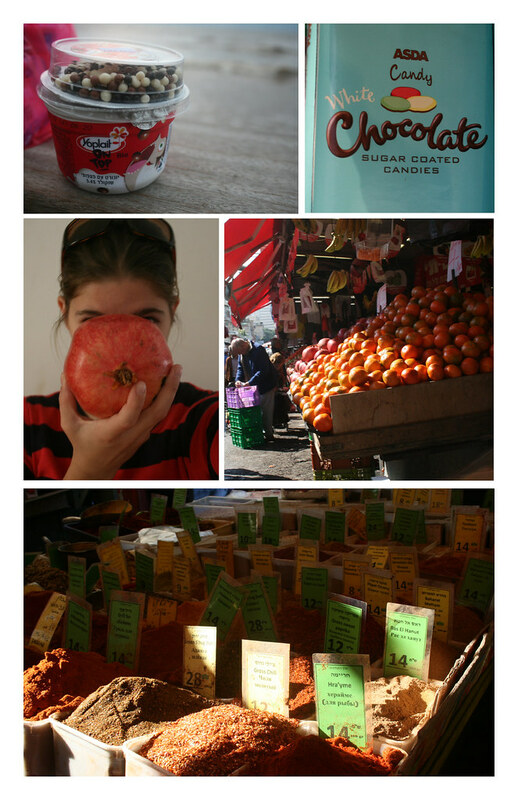 Furthermore, a lot of the more memorable things I did in Israel centered on food. I went to the Yemenite Quarter on my last day, and decided that I would walk up and down the market until I ran out of things to look at. Three hours later I emerged with a lamb pita and a pomegranate and a bunch of mediocre photos. On my last night, Jaime and I went to the fast food place on the corner to look for halloumi. Except it turned out the place we went was a meat-only place (how could we have known? It was all in Hebrew), and the guy who translated for us looked at us warily before leaving and said “Are you guys ok?” – not as in, can you complete the transaction, but as in, are you okay in the fundamental sense? His concern was heart-warming but also depressing, because I like people to feel that I’m not completely incompetent. We also spent a comical amount of time thinking about food while we were at the Dead Sea, because there wasn’t any food there (despite it being, you know, one of the world’s biggest tourist attractions). And, as is a theme, I spent a lot of time poking around grocery stores and corner stores. I brought back a packet of chocolate chips that I had every intention of putting into cookies but, now that I have them, I don’t want to open the bag with the ugly teddy bear logo and all the Hebrew writing. Ah–I wish you were here again! Now I have an orange, lemon, and pomelo tree in my yard. Make some cookies already with those chocolate chips! I’m so excited you stopped by! I love your blog!